In a medium mixing bowl, lightly whisk the eggs. Stir in the milk, flour, maple syrup, vanilla, cinnamon, and nutmeg, and whisk until blended. Gently stir in the pecans if using. In a 12-inch cast iron skillet, melt the butter over medium-high heat. Swirl the butter up the sides of the pan, ensuring that the whole pan is coated. 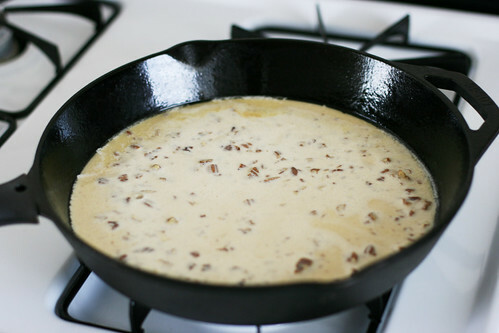 Once the butter is fully melted, turn off the heat and pour in the batter. Have a spatula handy to help you get everything out of the bowl quicker. Transfer the pan to the oven. Bake until the pancake rises and the edges are slightly browned, about 17 minutes. 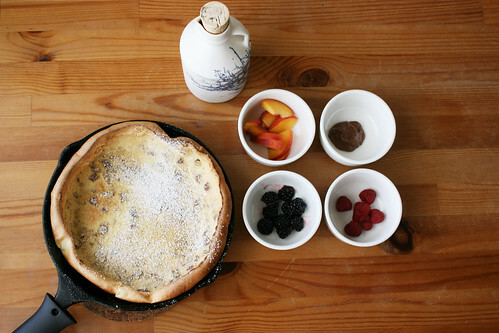 Working quickly, remove the pan from the oven and sprinkle the powdered sugar on the pancake until it is evenly covered. I do this with a small fine-meshed sieve. 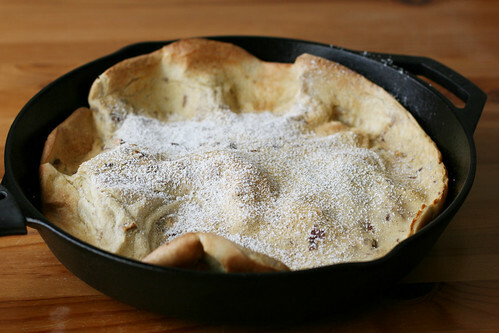 Return to the oven until the edges of the dutch baby are golden brown, about 3 minutes. Slide pancake onto a plate and slice in half. Sprinkle with peach slices, raspberries, and blackberries. Drizzle with Nutella and with additional maple syrup, if desired. Devour right away. If you’re not strict about your sodium intake, add a pinch of salt to the dough when adding the other spices. Dutch baby recipes typically call for 2 tablespoons of butter, but I only use enough to coat the pan, which is about 1/2 tablespoon. 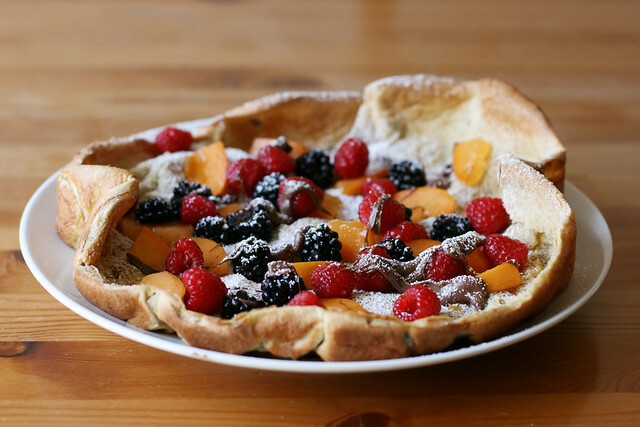 The traditional dutch baby has just the powdered sugar and a drizzle of freshly squeezed lemon as toppings. Half of an apricot instead of a peach is also nice if it’s ripe, and strawberries are tasty, too. I sometimes use blueberries, but I slice them in half when I do so they’re easier to stab with my fork. Sliced figs would also be very nice if they’re in season. When I make this for myself, I make it in the 9-inch cast iron skillet. I still use two eggs, but I use 1/3 cup of flour and whole milk each, and I half all of the other ingredients. 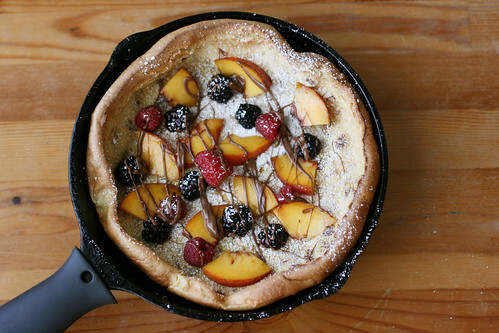 I know I said that a 9-inch dutch baby could serve two people in the past, but ours hasn’t served two since we got our 12-inch skillet, and I don’t believe it ever will again. We have this preseasoned skillet (Lodge 12-inch Cast-Iron Skillet, in case the link ever breaks), which comes with a handy silicone holder in case you’re as prone as me to burning yourself if the possibility arises. Having a batter bowl with a spout is very helpful whenever you need to pour anything liquidy. Ours (Le Creuset Stoneware 2-Quart Batter Bowl) predictably gets lots of use. Our large fish turner (OXO Good Grips Fish Turner) makes getting the pancake out of the skillet super easy, even when our skillet is not perfectly seasoned and the pancake sticks in one pesky spot. We also use it when cooking anything else that’s fragile, like fried eggs or fish. Our maple syrup container is handmade by Marianne Chénard, a ceramics artist in Montréal. We got ours from a boutique in Montréal, Gaïa ceramique, where they sometimes sell imperfect pieces at a discount. But we’ve also bought ‘perfect’ versions of this at full price as gifts. The container fits a 540 mL can of maple syrup perfectly, and between all of the dutch babies and granola we make with maple syrup, our container gets a ton of use.